Aquatic Invasive Species (AIS) are threatening the public’s angling and boating recreation and our state’s water and electrical infrastructure. 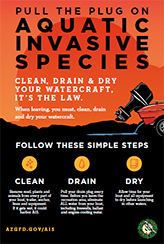 It is critical for anyone who owns or uses watercraft, or has a business reliant on watercraft, to understand the essential nature of this aquatic invasive species containment effort by the Arizona Game and Fish Department. The spread of quagga mussels and other aquatic invasive species has far-reaching impacts, both financial and ecological, that can touch virtually every resident of the state. Whether you fish, or boat, or simply get water and electricity to your home, these aquatic invaders WILL affect your lifestyle…and possibly your wallet. Clean & dry – Remove all mud, plants and mussels from your boat or equipment. This includes hull, anchor and chain/ lines, stern attachments, engine and trailer. Allow your boat and equipment to dry the best extent possible before transporting. For more specific protocols see Director’s Order #3. Remove plug and drain – Completely drain all water from bilge, live wells, ballast tanks and other compartments prior to transport. If applicable drain water from lower engine unit. Decontaminate and desiccate – Watercraft owners/ transporters are responsible for having their boats and equipment decontaminated after removal from waterbody and prior to transport. Before launching to another waterbody or transporting to another state, you must also desiccate you boat and equipment for 18 consecutive days from November through April or 7 consecutive days from May through October. For more detailed cleaning protocols, see Director’s Order #3. AIS Rules – Pull your plug!